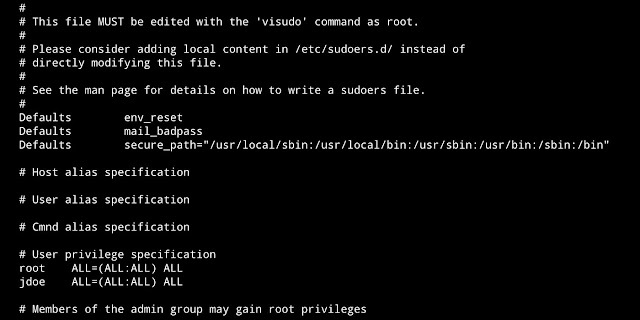 What is SUDO or Sudoers? Unlike su, sudo will request the password of the user calling the command, not the root password. Note: Never edit this file with a normal text editor! Always use the visudo command instead! 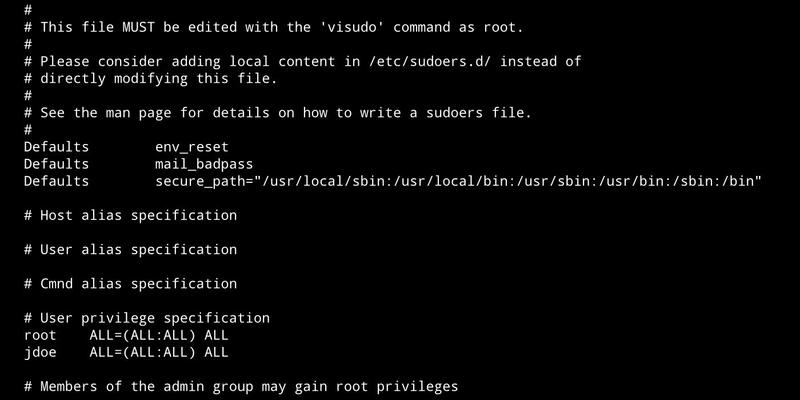 Because improper syntax in the sudoers file can leave you with a system where it is impossible to obtain elevated privileges, it is important to use the visudo command to edit the file. The visudo command opens a text editor like normal, but then validates the syntax of the file upon saving. This prevents configuration errors from blocking "sudo" operations, which may be your only way of obtaining root privileges. Traditionally, visudo opens the /etc/sudoers file with the "vi" text editor. How To Modify the Sudoers File? sudoers file has many lines, some are commented and some of which we will not discuss in this article. Let's take a look at what these lines do. The first line, "Defaults env_reset", resets the terminal environment to remove any user variables. This is a safety measure used to clear potentially harmful environmental variables from the sudo session. The second line, which begins with "Defaults secure_path=...", specifies the PATH (the places in the filesystem the operating system will look for applications) that will be used for sudo operations. This prevents using user paths which may be harmful. The third and fourth lines, we are somewhat familiar with. The fourth line you added yourself, but you might not have investigated the details of what each portion was accomplishing. The first field indicates the username that the rule will apply to (user1). The first "ALL" indicates that this rule applies to all hosts. The first "ALL" within the bracket indicates that the user1 user can run commands as all users. The second "ALL" withing the bracket indicates that the user1 user can run commands as all groups. The last "ALL" indicates these rules apply to all commands. This means that our "root" and "user1" users can run any command using sudo, as long as they provide their password. The last two lines are similar to the user privilege lines, but they specify sudo rules for groups. Names beginning with a "%" indicate group names. Here, we see the "admin" group can execute any command as any user on any host. Similarly, the "sudo" group can has the same privileges, but can execute as any group as well. The sudoers file can be organized more easily by grouping things with various kinds of "aliases". #The users in the OPERATORS group can run any command from any terminal. # The user linux can run any command from any terminal as any user in the OP group (root or operator). # user user2 may run any command from any machine in the OFNET network, as any user. # user user3 may run lpc and lprm from any machine. # user greenlinux may run any command from any machine acting as any user.